Author's Note: Steven L. Sears requires little introduction. 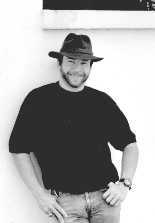 He is a co-executive producer of Xena: Warrior Princess and a major writing force for the show. He has penned numerous scripts, most of them independently but some in collaboration with others. He has given us some memorable moments and characters, and created much of the Amazon and Centaur element that runs through the show. Steve Sears gave us such characters, beloved by the fans, as Ephiny, Solari, Queen Melosa, and many more. He helped bring us through the tough times of Lucy Lawless' injury, and helped guide us through the difficult rift period. 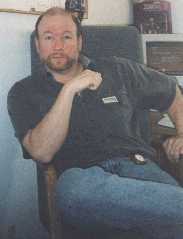 Steve Sears has been one of the most accessible to fans of the XenaStaff. He has made himself available for comment, questions, and has been approachable at various conventions. Because of this accessibility, he has also taken more flack than most XenaStaff members. Yet, whether you like what he has to say or not, you have to admire someone willing to stand up and take it. I, for one, am very grateful that Steve Sears took a significant chunk of his time in the first week of June 1998 to share his thoughts on his experiences with the show. Writer Steve Sears, in his natural habitat. Hi, nice to talk to you again. Is this a good time for you? Before Xena: Warrior Princess , you had been a writer for a number of television shows, SWAMP THING (1990) and THE A-TEAM (1983-1987) to name just two. Given you had a background in television writing, although I know that is not what you originally came to California to do (which I believe was to act), how did you come into contact with the Xenaverse? [smiles] Xena, the Land of Xena. There are two parts to this story. This is just a bit of background, connective tissue, which doesn't play into how I actually got into the Xenaverse, but a long, long, long, long, long, long time ago, I can't remember exactly when but it was about five or six years ago, I was pitching pilots around the town trying to get a studio deal or get something going with the networks, which I eventually did do. I had a screenplay that I had sent around which got a lot of good reactions and I was getting a lot of meetings. Way, way, way, way, way back then one of the pitch meetings I had was with a little company called Renaissance. I went in to talk to David Eick. He had a little tiny office on the Universal lot and he said "We're Renaissance, we're not very big, and this office is our entire television production office." Which I thought was kinda funny. We sat there and talked about some possible pilot ideas, and then he said "Have you ever seen any of the HERCULES movies?" I said "Yes, I've seen all of them." He said "We're going to do HERCULES , but we're not going to do it like the HERCULES movies. We're not exactly sure what we're going to do yet, but we're going to be doing some HERCULES movies for television." I said "That's cool!" and he said "I'm just telling you that in case we get back to you later. As it was, they didn't get back to me on Hercules . Years later, when XENA was about to start up, they hired a staff. The first person Rob [Tapert] hired was R.J. Stewart. Then they were looking for a supervising producer. They ended up hiring Babs Greyhosky. She was the first person to hire me. She was producing RIP TIDE back in 1984. Babs and I are good friends and we've known each other since then, we keep in touch, whenever one of us is working in a show we give the other a call because Babs is an incredible writer. When she ended up on XENA and they were talking about getting some writers in to write some scripts she ended up bringing me in. I came in for this kind of "meet and greet" so they could see what I looked like and how we'd interact. As I remember, it was Babs, R.J., Rob Tapert, I'm not sure if Liz [Friedman] was in the meeting or not, and I'm not sure if Sam [Raimi] was there or not, I can't remember. I came in, we talked about it, I asked questions about the series. One of the questions I asked was "Are they going to be using the demigods as well as the major gods?" Rob said "I'm not sure what you mean by that." I said that a demigod is not quite a god like Zeus or Ares or anything like that, a demigod is one of the gods in between, for example..." And right there on the spot I made up a story about the god Morpheus, who was the god of dreams, and how Gabrielle might get involved. I literally made it up on the spot. Oh, good heavens that is DREAMWORKER (03/103)! [laughs] I went through the entire thing and when I was done Rob looked at me and said "That's a great idea!" I wasn't even pitching an idea I was trying to ask questions, so I said "Yeah, it's a great idea, but answer the question." [both laugh] They asked me to come back and pitch some more ideas. I came back a week later and pitched about four or five ideas, and they said "The best one we like of all of them is still that DREAMWORKER one." They hired me to write that as a script. So I wrote it, I wrote it very well, they loved it, and they wanted me to come on staff but Renaissance just didn't have the money for another producer. What we agreed on is that I would come on as a creative consultant. During all of this Babs had decided to leave the show. She had some other things that were going on and she wanted to pursue them. Her contract was for, I believe, four to six episodes. She completed those and left. When she was gone I realized there was a producing position open. I went to R.J. Stewart and I said "There's a producing position open, you know my background." He said "You know something, you're right." That started the mechanism, he talked to Rob, Rob talked to Sam, Sam talked to R.J., it went around and I was hired on as Supervising Producer. That's how I got in. Xena gives up fighting for about five minutes in SINS OF THE PAST. That leads in to an area that many fans from the early days talk about. DREAMWORKER (03/103) is a pivotal episode in the show and many fans say that in order to really understand what is going on in Xena , you have to see DREAMWORKER . Would you say that is accurate? [thinks] I'll half agree with it. It sets up a major, major line with Gabrielle. Indeed, the "blood innocence" theme has been an essential thread throughout the whole series. Without that setting up with Gabrielle we'd have to have found another way to contrast Xena's torment. However, I'd say that SINS OF THE PAST pretty much laid the groundwork. We tend to take SINS OF THE PAST for granted because it was a pilot episode, but without it, there wouldn't have been any of the groundwork, there wouldn't have been anything to build on. So I think the entire series was really set up by the first ten minutes of SINS OF THE PAST where Xena was burying her weapons, and for all intents and purposes Xena was dead. Then she made a decision to defend those people. If you take SINS OF THE PAST out of it then DREAMWORKER sets up a major thread throughout the entire series which will continue because it also defines very, very distinctly the relationship and the differences between the two girls. I would like to discuss more about Gabrielle's "blood innocence" later into the interview. Was DREAMWORKER actually your first full script with the series? Yeeh, that was the first one I wrote for Xena . I understand that in the script process there are meetings where people contribute to the basic idea in a script. There may be more or fewer elements of one particular writer as the result of that process. From what you told me, however, about your "non-pitch" session, this seems to be primarily your story alone from start to finish. You know, that's a hard thing to answer. It's such a norm in this business to collaborate. There were things of mine in DREAMWORKER that were there from the beginning straight through to the end. But by the same token I'd say the demands and particulars of the characters have become much more specific as we've gone on. The neat thing about writing a series that has just gone on the air is that everything is wide open. You're still trying to focus in on the characters. The actors and actresses are still trying to focus on what the character is coming off the page, and you're adjusting to how they portray those characters. There's an interesting freedom at the beginning of a series. When you get more into a series you actually end up with more restrictions. You try some experiments and they don't work and you say "Well, I can't do *those* anymore", even though doing them was a lot of fun and allows you a lot more freedom to explore. 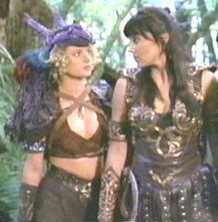 Xena and Ephiny didn't hit it off in HOOVES AND HARLOTS. Speaking of leading in a new direction, that leads us into your next episode which was HOOVES AND HARLOTS (10/110). This is a personal favorite of mine, but here you have created a number of characters that, although they'd only been seen once or rarely, have really endured with fans. There are Ephiny, Eponin, Melosa, and the whole thread with the Centaurs, too. Was this a hard sell or an easy thing to do? The initial idea was easy. There were two major elements I remember from back then. [Going into character] I'm an old man, lookin' back several years here. [both laugh] I don't keep a diary, I should have. I had seen the Centaurs they did on HERCULES and I thought they were great. They did an incredible job putting them together and I thought they were a lot of fun. Rob said "I want to do an episode with Centaurs, let's get some Centaurs in here." I grabbed hold of that because I wanted to do it. There was another thing I wanted to do. I realized how limiting it was for Gabrielle to be walking around in that peasant outfit all the time, just standing around in the background going "Go, Xena, get em, Xena!" We had already gotten tired of it just in what we'd seen. I thought she should be able to defend herself with but not a weapon where she could kill. Theoretically you can kill anybody with anything, but I wanted her to have a weapon that was primarily defensive. I remembered back when I was in martial arts and I was training. My first weapon was the bo staff. The way I was introduced to the bo staff was my instructor had a bo staff. He handed me a wooden sword, a katana made of wood. My instructor said "I want you to try and touch me with that sword in such a way as if you could cut me." I said "OK, fine." All he did, and you have to try and picture this, all he did was stand there and put one end of the bo staff on the ground, and he held the bo staff straight up and down. I tried to touch him, and he'd make the slightest move with that bo staff. I couldn't get around the damn bo staff. No matter which way I moved, if I tried to move around him he'd move to the other side of the bo staff. He effectively kept me from doing anything. I remember thinking to myself "This is incredible, this is a simple walking stick. That's all it is, yet this guy has completely prevented me from doing anything." . That's the weapon I wanted to use. That's why the opening scene starts off with Gabrielle talking about getting a walking stick, because that was the perception I had at the time. With those to elements in mind, I had to go off and write a script. It would be interesting for me to drag out the first draft of HOOVES AND HARLOTS , it's completely different. This was a script that had a major change after the first draft. I'm very proud to say I was the one who came up with the idea for doing the change even though it required an incredible amount of work on my part. But the bottom line is I love to write and the final project is what I'm looking at. In the original script, an Amazon had been killed and the Amazons suspected the Centaurs, and then a Centaur was killed. The Centaurs then suspected the Amazons. That was the basic beginning. Xena knew there was another person involved but she ended up going back and forth between the Amazons and Centaurs trying to prevent a war. The script was one of those scripts where if you read it scene by scene everything was fine, but if you stepped back to look at it something was missing from the whole story. To simplify it, what it was, it was Xena bouncing back and forth. She was a ping-pong ball, she wasn't doing anything. So it wasn't very heroic. We sat there and tried to noodle this and figure out what to do. We have two sets of characters, two tribes, the third element, etcetera etcetera etcetera. Finally what popped into my head was "What if the Centaur hasn't been killed? What if the Amazons are going to kill him? What if they're going to execute him thinking he killed the Amazon?" Everybody just went "Oh, wow, that's it, that's great." That ended up being the change that made the script work, having Phantes dragged in as being the killer of Terreis suddenly launched everything else. It gave the opportunity to have one of the Centaurs there in the camp with the Amazons to see their reaction and interaction with each other, and to have Xena observe that and say "This doesn't make sense, this isn't quite here." That's the Xena storyline. The Gabrielle storyline, believe it or not, even though that episode set up so much about Gabrielle being an Amazon princess and set up so many great storylines later on, I really wasn't even thinking about that when I wrote the story. I was thinking "Wouldn't it be cool if she was taken in to the Amazons and Xena didn't know she had been given this Right of Caste." All I wanted to get to was that Gabrielle had to kill Phantes. So I kind of manufactured everything else to get to that point. I figured I would worry about the repercussions later on because when she left there, what does she do, she gives the crown back. Originally I thought she'd give the Right of Caste over to Ephiny. But as we've seen I decided not to choose that and I'm glad that, for whatever reason, I didn't choose that direction. Steve Sears told the "chobo" story and several other delightful anecdotes at WarriorCon. HOOVES (10/110) has been a consistent favorite of fans, for a variety of reasons. I have heard you speak at conventions before and have heard at least two wonderful stories that came out of this episode. One of them was the "chobo incident" and how that name came to be [When Steve was writing HOOVES AND HARLOTS , there was a point in the script when Xena selects the weapons she and Queen Melosa will fight with. Steve had a small, hand-held pole weapon in mind, but he could not think of what the name was offhand. As he was writing, he looked out the window and saw a girl eating a "churro", a kind of rolled-up fast food. He put down "chobo" in the script with the intent of doing a "search and replace" on it later. He got busy and never got around to that. When he heard the word "chobo" as someone was listening to the dailies from HOOVES , he thought to himself, "Oops"]. Another was, and I want to make sure I explain this properly, when the episode first aired, many people were angry at the Ephiny character because she was mean to Gabrielle. I remember you telling me later, that in future episodes, you very deliberately set out to make the audience love Ephiny. Well I knew that would happen. After you've been writing for as long as I have you realize when some things will naturally happen. Many times a person's worst enemy can be their best friend if you overcome what made them an enemy in the first place. There's a passion behind that. There's an old adage that the opposite of love is not hate. The opposite of love is indifference. Hate is another form of passion. So if a character hates you, they have a passion for you. If you can tweak that and turn it around the passion is still there. I kind of knew that if we used Ephiny later on, we would have to do one of two things: make her a total enemy, which wasn't in the character from the beginning, or, using the words I used back then, she would end up being the protector of Gabrielle. Which is what happened. Another interesting thing about HOOVES AND HARLOTS (10/110), and I do not know if you set out to do this deliberately or not, but I notice that the differences between Amazons and Centaurs can be a nice way to put some modern social problems into context. As I heard Mike Levine say once, it can be problematic to discuss differences between people in a modern setting, but many of these problems go away when you talk about Amazons and Centaurs. That's true, that's very true. In a fantasy setting, you can write things and see the stupidity of modern prejudices, but still do that and entertain as well. You're right, we had moral leeway to do that and I certainly took advantage of it. The Centaurs on XENA are slightly different than the Centaurs on HERCULES , but I use that as a springboard. In our mythological world Centaurs are the outcasts. You don't want to eat at the same table, they're disgusting animals, that's the way other people would look at them. And the Amazons... to me it's funny because they represent two different minorities who, if they work together, could accomplish great things, but they're too busy fighting each other. They have too many differences between them even though at one time they worked together. HOOVES AND HARLOTS gave me the opportunity to explore the history of why these two peoples hate each other, since at one time they were allies. It all goes back to the Battle of Corinth, which I think has become one of our pivotal events in XENA history. We will be elaborating more on that as we go through the season. During that time, as has been established in a few other episodes, the Centaurs and the Amazons ended up warring against Xena. They united as an agreement with King Sisyphus to defend Corinth. Sisyphus is another interesting character that comes up from time to time in the show. I heard someone comment the other day that we have seen gods and such in Xena , but we have not really seen any magicians or magic as such. Yet, Sisyphus is a magician. Yes, but he's a magician in a twentieth century sense. He's not a sorcerer. We're careful not to use that term. There are a few words we throw out immediately when we hear them because we want to rationalize them differently. Sorcerer is one, magic is another. Gabrielle plays nursemaid, psychoanalyst, cheerleader, and mother to many of the other bards. In moving on to ATHENS CITY ACADEMY OF PERFORMING BARDS (13/113), every show needs to have a clip show or bottle show from time to time for scheduling purposes. Yet, this started a trend of imaginative clip shows. I love the names of some of the characters, Stallonus and such. R.J. and I had a hoot with that one. We were trying to find a different way to do a clip show, something other than characters sitting around saying "Hey, remember when you did this?" We were at a local spot where we'd chat and have a little appetizer and that's where this idea was born. I had made the comment that we have a natural storyteller in Gabrielle, so she can certainly talk about the flashbacks. R.J. said "What if she's in a competition and she *has* to talk about them?" It went right out of that. Coming up with the character names, we had a ball with that. Stallonus was hysterical. Euripides was obviously from history. We tried to model his very pedantic style. It was all very successful. I was very pleased with that. Using all the old cheesy "Hercules" film clips, I still get a chuckle out of it. It's certainly my favorite clip show. That was an interesting episode and it got pulled off real well. I wanted to do a sequel with it. That's still not out the door. The problem is, you end up with good actors as guest stars and they end up working on other series. At one time I was working on a sequel. I wanted to bring all the kids from that episode back. They heard all these adventures of Xena from Gabrielle so they wanted to go on one with her. Basically we'd do the first half of the John Wayne movie "The Cowboys". It never got to that point because for one thing we couldn't get the guy who played Homer and then we lost one of the other ones, so we said "let's pass" because it was too hard to coordinate all the schedules. It would've been fun. In A FISTFUL OF DINARS (14/114), which was your homage to the spaghetti westerns, you and R.J. are credited with doing that together. Was it more the case than not in the early days for you to work together to get these scripts done? How easy was that to do with someone as opposed to on your own? Did you have separate parts that you would go off and do and then bring it all together? This is actually part of a much larger question about writing in general, and working with partners. When I started writing I had a partner. He and I worked together for about two and a half years then we separated the partnership amicably. We don't hate each other, none of that happened, but we discovered we were writing individual scripts and then handing it to the other to do a polish on. Kind of a Lennon/McCartney thing. One of the producers we were working for, Frank Lupo, found out we were doing that and he said "Why are you doing that? You guys could be making twice as much money and giving me twice as much material." So he had our contracts separated, which by the way is unheard of in this industry because it does imply that the studio has to pay more money. Frank was a great guy, though. I remember many of his shows and they were exciting. Frank's great. He's fun to work with. Finding a partner, someone you can actually write with and get the correct style with, is very, very hard to do. It's extremely difficult to do. R.J. and I matched up very well. He and I have differences here and there but for the most part he and I can jump together on a script and blast one out. With this particular script, the way we did it, we worked on the story together. We worked on the usual process as if we were a writing team. Everybody came in, we talked about the stories and worked it out on paper. When it came down to it, we basically split it right down the middle. I can't remember who took which part but one of us took the first half and the other one took the second half. We wrote them, then we exchanged the acts and made notes in the margin saying things like "This is where the continuity breaks down because I had the character say this and you had him say that." We went back and forth and kept smoothing it down. Then it was done. The funny thing is, R.J. is a very quick writer and I'm a very quick writer. There are times when we can jump on a script together and literally write the first draft in a weekend. That must come in handy with some of those schedules you have. Well, that's actually how FISTFUL OF DINARS came about. We were behind a little bit in our schedule. So R.J. and I jumped on it together. I can't remember how many he and I have worked on together but we don't do that as much these days. There's too much other stuff going on. Xena goes undercover, unwillingly, in THE ROYAL COUPLE OF THIEVES. THE ROYAL COUPLE OF THIEVES (17/117) is the first time we see Autolycus in the Xenaverse. That looked like a lot of fun. It *was* a lot of fun. Did you know Bruce Campbell very well at that time? I'd seen him on [THE ADVENTURES OF] BRISCO COUNTY[,JR] (TV, 1993-94) but I didn't know him personally. Did you know he was going to play the part before you wrote it? Yep. When XENA first went on the air we had a party. We all got together over at the Universal Hilton. We were going to watch the premier episode for the second season of HERCULES and then watch the premier episode of XENA . The premier season for the second season of HERCULES was THE KING OF THIEVES . So as we sat there and watched it, I thought "This is a fun character. I really like this character. Boy, it'd be fun to write, I hope we get him." Sure enough, we decided to do one with Autolycus and I was lucky enough to get the script. I fought for it, to be honest. [both laugh] But I got it. It was an absolute hoot. It was a comedy. I like to look at the relationship between Xena and Autolycus in that episode as being very much like the Kathryn Hepburn/Spencer Tracy type of relationship. There's that very close bond, that unspoken affection for each other, and yet that bickering. That little bit of one-upsmanship that they want to do. In THE ROYAL COUPLE OF THIEVES , for most of it, the middle part anyway, Autolycus got the one-up. Xena was forced to stay undercover. Because she was forced to stay undercover she had to agree to his premise which was "This is my concubine." And Bruce is just very funny. He's very charismatic. He's fun to watch. He's got very good comedic timing. That was a fun episode.